Born RumbidzayiMugwira, but affectionately known as “Chamvary”, she was born and bred in the capital Harare. Her love and interest for radio broadcasting was sparked back when she was a primary school going child in 1994. “We moved into our new home in Greystone Park in 1994, and our T.V broke during the moving process. So, we only had the radio as our source of entertainment on what was happening in the world, and this was for just over 3 months. It became radio 24/7 for us.” It was then that she took a great interest in the presenters on radio as well as their presentation styles and their music selections on their programmes. “Another source of inspiration to join radio was my late father and his love for legendary rock group Queen. My all time favourite from them is Radio Gaga. That is my “pick-me-up song.” She says. Her TV debut came through in July 2007 when she was called to present a prime time TV show called Sisonke Mix then later on Music Mix and Music Request for 3 years. 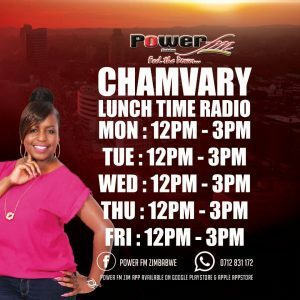 Chamvary began her incredible radio career in 2012 when she joined Zimbabwe’s Number 1 radio station Power FM on the 629.com Breakfast Show. She currently hosts the lunch time radio from 12:00- 15:00pmChamvary says she hopes to live and survive long in the competitive broadcasting industry but believes education is a big necessity in one’s life.